If there’s an area in a photo that should be white or gray but has a color cast, you can balance the photo’s overall color. Sometimes color casts are caused by lighting conditions—for example, a photo may have a yellow or orange cast from the light fixtures in the location where the photo was taken. By changing the white balance, you can remove the color cast and make white areas appear more white. In the Adjust pane, click the disclosure triangle next to White Balance. 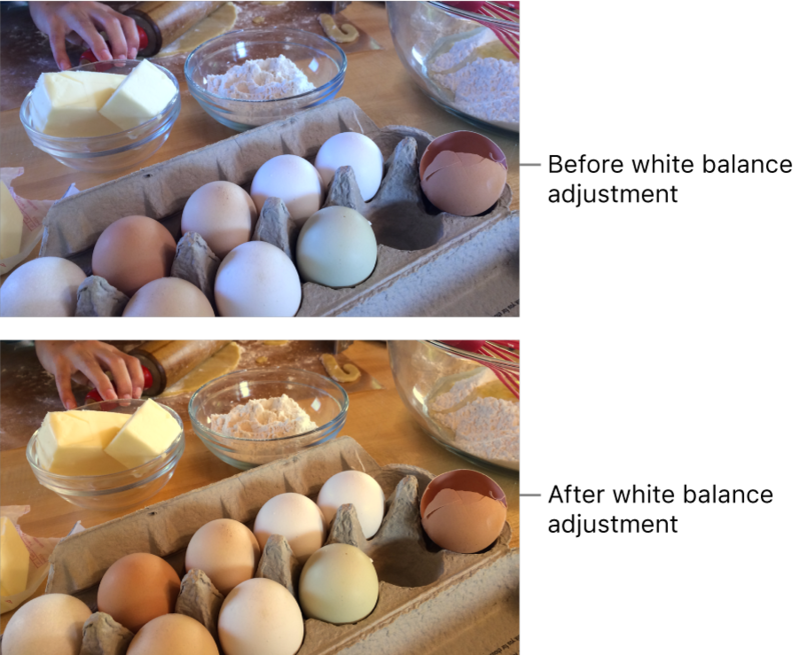 Click the pop-up menu and choose the type of white balance correction you’d like to make. Click the Eyedropper button and click the eyedropper in a corresponding area of the photo. Neutral Gray: Balances the warmth of an image based on natural gray. With the eyedropper, click in a neutral gray area to automatically adjust the gray areas of your photo. Skin Tone: Balances the warmth of an image based on skin tones. With the eyedropper, click in an area of a person’s skin to automatically adjust the skin tones of your photo. Temperature/Tint: Balances the warmth of an image by adjusting color temperatures (blue to yellow) and tint (green to magenta). With the eyedropper, click in a neutral gray area to automatically adjust the temperature and tint of gray areas of your photo.